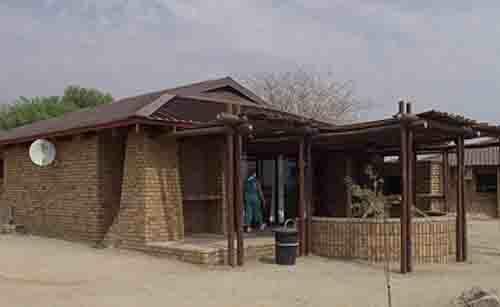 Over the past few weeks I have been posting articles about places I visited on my recent trip to the Northern Cape. In this dry and dusty semi desert region of our country there is a a great need for water and that is supplied by the Orange River, one of South Africa's longest rivers. This river not only supplies water to the area but also has a tourist attraction which is world renowned. 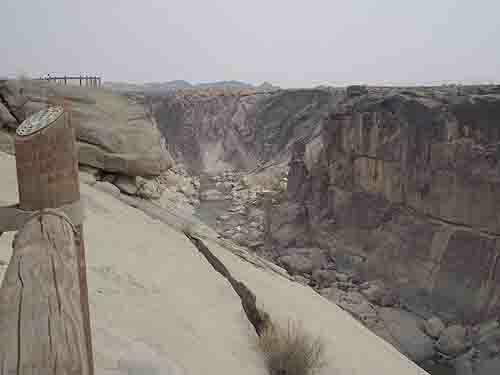 The attraction I am speaking of is the Augrabies waterfalls near Kakamas where the Orange river tumbles over a 60 metre drop into a 240 metre deep gorge before continuing on its way to the sea. Looking at these measurements and having seen the falls it is difficult to imagine that the gorge is as deep as people say it is. Another statistic which is also difficult to believe is that this gorge cut out of the granite by the river eroding the rock is 18 kilometres long. From the boardwalks around the falls one cannot see more than about 800 metres of the gorge as it runs away to the west. To compare this waterfall with the Victoria Falls would be difficult as the Victoria Falls are more spectacular with a much wider drop off area than the Augrabies. 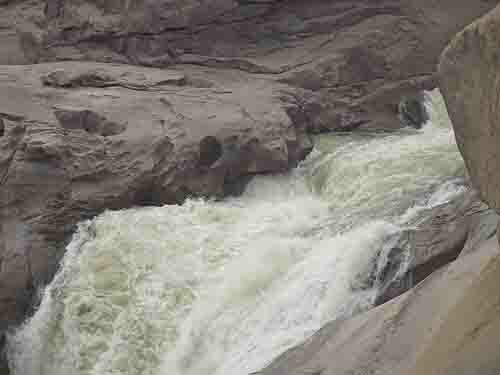 When we visited the Augrabies falls the river was quite low so water was entering the gorge through the main fall. When the river is in flood water runs into the gorge from all directions causing a big spray to form. 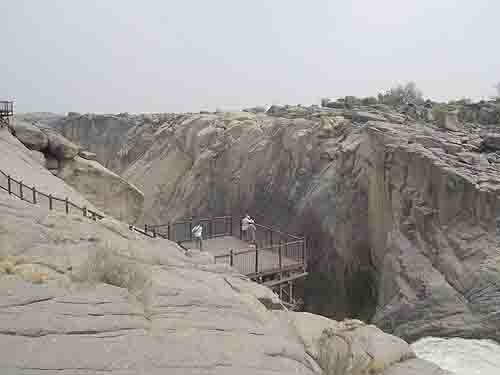 The Augrabies Falls have had two big floods in recent years one in 1988 when it is estimated that 7800 cubic metres of water went over the fall every second, and, the flood in 2006 when it was estimated that 6800 cubic metres of water went over the falls every second. To put this perspective for foreigners to South Africa and people who have seen the Niagara Falls in flood, the Augrabies falls are three times bigger than the Niagara Falls in terms of water going over the falls in a flood season. Niagara in flood only has 2400 cubic meters per second. In my previous post on Kakamas I mentioned how the Orange river flooded the Kakamas area two to three kilometres inland from the normal course of the river to a depth of 1.5 metres so you can just imagine the volume of water making its way over the falls when the river is in flood. 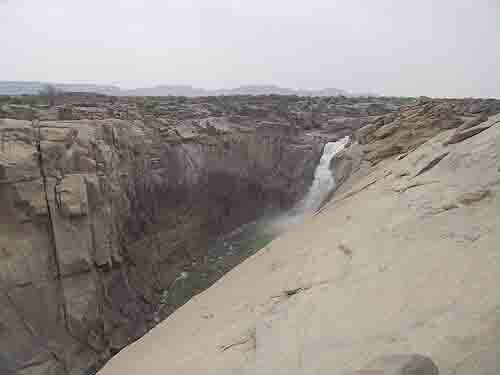 The Augrabies Falls and the cliff faces lining the gorge are very dangerous when the river is not in flood but are even more dangerous when they are. To protect people from falling into the river Sanparks have put up boardwalks and railings and viewpoints all along the gorge so that people can get to see the falls. I would however imagine that in flood times the level of the water in the gorge would be so high as to nearly reach the level of the viewpoints which are at least 80 metres above the level of the river. Another interesting thing you can see when looking down into the gorge from the various viewpoints is the granite sides of the gorge, Granite is cooled down volcanic magma and although very hard it is eroded away by chemicals and water. Granite is much like an onion and has a number of layers lying on top of one another. 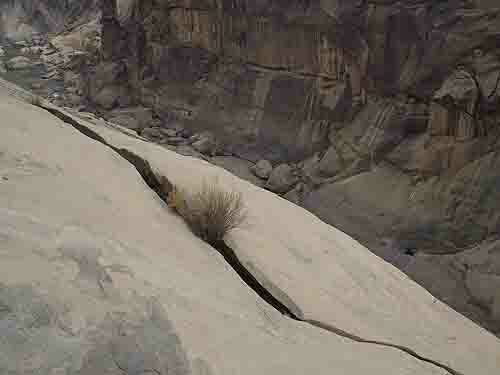 In the above photo you can see how erosion is causing a layer to begin breaking away from its base. In due course it will fall away and land in the river causing the river to divert or flood if the gorge becomes blocked. To protect the Augrabies Falls from vandalism and to preserve the area in a pristine condition for future generations it has been included in the Augrabies National Park. The park has 59 chalets as well as a campsite for people with caravans and tents. Also in the park is a big Administrative centre which contains a shop, restaurant and offices. The 28 000 hectares of the park which are found on both the northern and southern sides of the Orange River are home to antelope such as the springbok and gemsbok and also the endangered black rhino. There are also may birds to be found in the area. 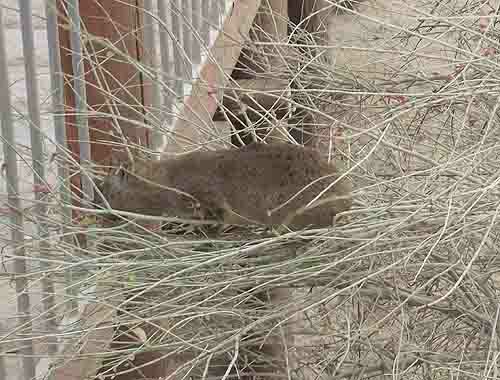 Near the community centre and scattered around the wooden walkways to the viewpoints you will find many hyrax (dassies). These animals are said to be related to the elephant but I cannot see the relationship. The dassies are quite entertaining as they climb the trees to pick berries. When walking along the boardwalks you will also come across a number of colourful lizards which run around on the rocks chasing one another. 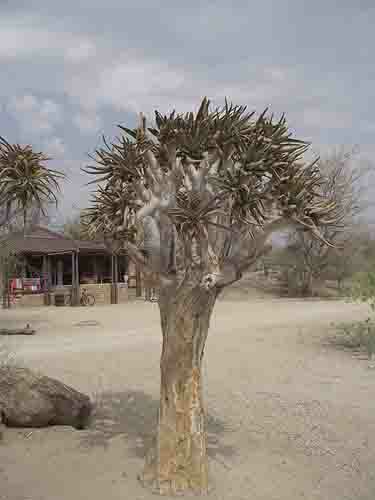 Another interesting inhabitant of the park is the Kokerboom or Quiver Tree Aloe with its distinctive shape. They are succulents and can store huge amounts of water in their stems and so survive long periods of drought. The wild trees seem to like growing on mountain slopes and where you find one there are normally a few more. There are a number of hiking trails in the park, the longest is the Klipspringer Hiking trail which takes 3 days, 2 nights to complete. This trail is limited to a maximum of 12 and a minimum of 2 people. Due to the heat from October to March this trail is closed. There is however a shorter 5 kilometre trail which can be undertaken by all visitors to the park and gives you some good views of the gorge and the park. It's called the Dassie Nature Trail. 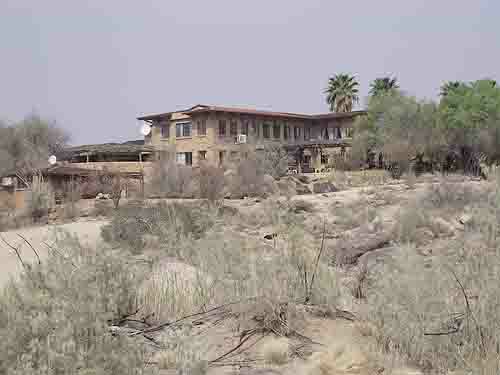 For those who don't mind the heat and flies this park and enjoy roughing it a bit, this park is for you. If you like your creature comforts then visit the falls on a day pass. 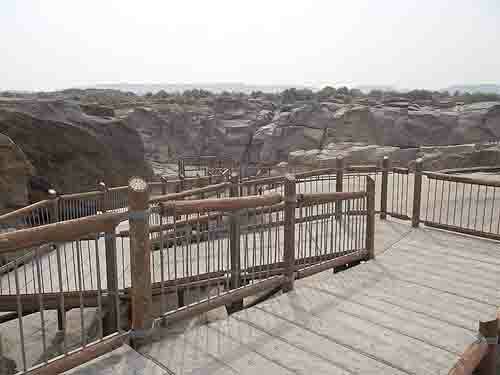 Either way when visiting the Northern Cape you must visit the Augrabies falls.